Iran has a culture as rich as its history. If you travel to Iran, you may see lots of cases in Iranians’ behaviors that are amazing or sometimes perplexing for you. So you’d better know these Iranian customs so that you can communicate better. Here, Iran Destination, a travel agency in Iran, provides you with the most important and usual customs in Iran. This Iran travel agent is ready to help you by any means, so do not hesitate to contact us if you have any questions. Let’s continue our talk about Etiquettes and Customs in Iran. Maybe the most common and confusing custom you encounter in Iran is Taarof. Taarof is a way of being polite in Iran and it can be both verbal and non-verbal. Taarof shows respectfulness and being humble, in fact. Just imagine you want to pay for something in a shop. Any Iranian accompanying you will offer to pay the money instead of you. Also you can encounter Taarofing when you are at a dining table. Iranians deny the offered food and say “no, thanks!”, while they want to taste the food in heart. If you insist and offer the food twice or three times, they may accept it and taste that food. Another usual taarof may be letting others pass through the door first, before you, saying “after you”. And they may answer “no, please you go ahead first”. The more people get closer in their relationships, the less they Taarof in their daily lives. First, we assume you are invited to an Iranian house. Keep in mind, first, to see if the host is wearing shoes or not. If not, you have to remove yours shoes too. You’ll probably be invited to the guest room. If there is no dining table, do not get shocked. Some Iranians serve the food on a cloth spread on the floor. But in more modern houses, you’ll find a dining table. It is more common to use only spoon and fork in Iran. You may also be surprised by the amount of food they have prepared! Iranians usually are proud to prepare food, more than it is needed. They do so to respect their guests. Try to finish your meal totally and also try a little from all kinds of the foods prepared; this shows you are interested in their food and there is nothing wrong with that. Iranians are considered superstitious people. One of the cases they are very sensitive about is the evil eye. The concept of evil eye is about causing someone bad luck, just by being aware of their success. So Iranians try to keep their successes secretly. And in cases it is revealed, like when they get a new job or they get married, they burn Esfand, wild rue seeds, and they pop the smoke over the head of anyone they want to keep safe from the evil eye. Esfand also has some medical properties which cleans and purifies the air. So don’t be surprised to feel the pleasant smell of Esfand while you pass in the allies and streets in Iran or when you participate in some Iranian ceremonies. It’s considered rude to sit with your back to someone in Iran. So try not to ever sit in this way, and if you have no other choice, apologize to others. You may hear the sentence: “a flower has no front or back”. These sentences are also some instances of Taarof. It’s really common among Iranians to give gifts; like when someone returns from a trip or when they achieve a success in their life, they buy a house, etc. during the New Year eve (Nowruz), people give monetary gifts to anyone who provides services for them and also to the Youngers in their family. This gift can be new bank notes or gold coins. If you want to have a gift with you for going to someone’s house, you can buy flowers, or confectionery. Keep in mind to wrap the gift elegantly. The one who receives it will not open it immediately. So do not consider it as an offense. This may be funny to know that Iranians sometimes raise their eyebrows instead of buttering to say No! Even sometimes, you may hear a sound of “Noch” made by sucking the tongue. Perhaps it can be considered as a more subtle way of saying no. Some weeks before a business meeting, you need to make an appointment in Iran. And when you arrive in Iran, like one week before the appointment, confirm the meeting. Be on time and look punctual. And if you have written material with you, you need to translate it both into Farsi and English. In case you have any other issues in mind, please feel free to contact this Iran travel agency. We are always available. 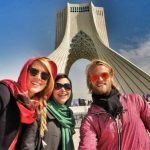 And if you have decided to travel to Iran, please take a look at our Iran tour packages and just choose an Iran tour; we’ll do the rest to arrange a nice trip for you.